Autumn is upon us, which means smart gardeners are planning to plant not only spring-blooming bulbs but also hardy perennials and woody ornamentals. However, one group of plants that often gets overlooked at this time of year is the biennials; an odd group of plants that spans two growing seasons and the winter in between to grow, mature and complete their life cycles. When started from seed, these plants need the heat of late summer to germinate, and then spend the cold days of winter developing strong root systems to enable them not only to survive but thrive. As temperatures climb upwards once again the following spring and summer, they are mature enough to develop flowers and then seeds before their days in the garden end. 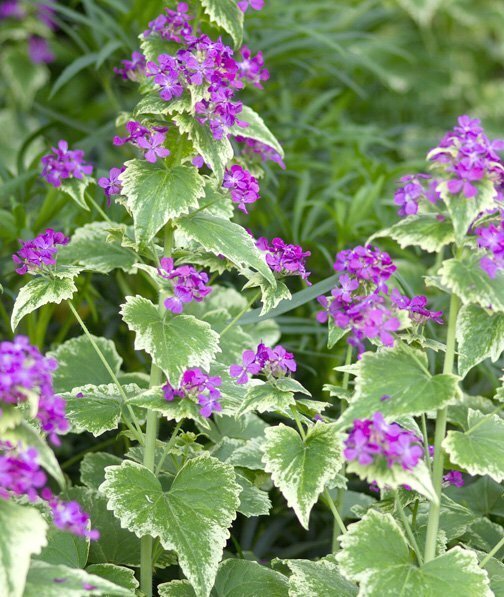 Listed below are three popular—and even more importantly, deer resistant—biennials that will reward your garden work now, and patience later, with pretty displays of spring and summertime flowers. The seeds of this springtime visual treat are best situated in a location that receives full winter sun, but becomes partially shaded later in the day at the beginning of the next growing season when surrounding bushes and trees leaf out. 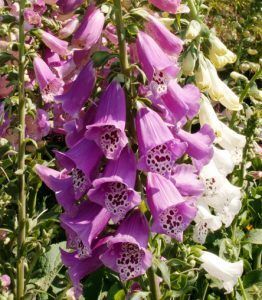 In the spring, established foxgloves will develop their signature bloom spikes covered in beautiful bell-shaped blossoms. Including their flower towers, these plants can reach 5 feet tall, meaning it is not a bad idea to stake them if they are in an open location exposed to prevailing winds. Another way to beat the breezes is to plant a short selection such as the popular ‘Foxy’, which rises to a restrained 3 feet. Gardeners love hollyhocks, but not all backyard growers understand what is necessary to get the best displays from this plant. Hollyhocks are very pretty when they bloom in the late spring, but after their flowers fade, the ugly takes over. The plants get rangy, the foliage becomes susceptible to rust disease and caterpillar damage, and the stalks fall over—not a pretty sight. 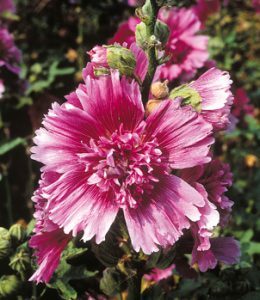 To enjoy the beauty without dealing with the beast, simply pull up the spent plants and reseed with fresh, store-bought hollyhock seeds later in the growing season. If you grow heirloom hollyhocks and don’t mind raggedy-looking plants, wait at least until the seed pods dry and then sow the free seeds after yanking out the old stalks to start the biennial cycle over again. There are plenty of cultivars available that display classic cone-shaped hollyhock blooms, but don’t overlook the double, ruffled flowers of such pretty selections as ‘Queeny Purple’ and ‘Powderpuff’. Also known as money plant, this interesting biennial is popular for its round, parchment-like seed pods that have the shine of freshly minted coins. The seeds will produce 2 to 3-foot plants in the spring that pop with clusters of white or purple flowers above the foliage. After the blooms fade, the unusual pods, which are often included in flower arrangements, develop and are ready for use after the outer coverings fade from a modest green to a light brown. 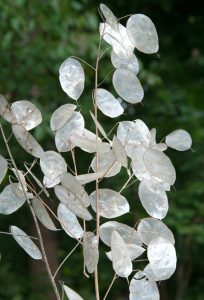 Keep in mind that lunaria seeds will readily sprout in the garden and sometimes spread to the point of crowding other plants, but regularly harvesting pods as they mature will help prevent this. 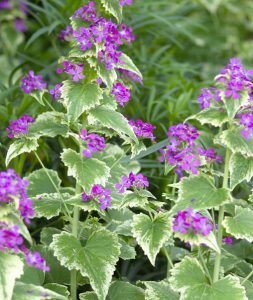 Worth searching for locally or online is variegated lunaria, which adds extra visual zing to the spring garden by showing off leaves generously streaked in buttery yellow.